Create an eye-catching pineapple centerpiece as fresh table decor. If you are hosting a tropical, island, Hawaiian or beach-inspired dinner party or special event, transform a pineapple into a glowing table centerpiece using candles. Pineapple centerpieces are economical decor items, as you can serve the fruit as a tasty party appetizer or use it to make a dessert or salsa. A pineapple centerpiece is simple to create and is ideal for a last-minute soiree. 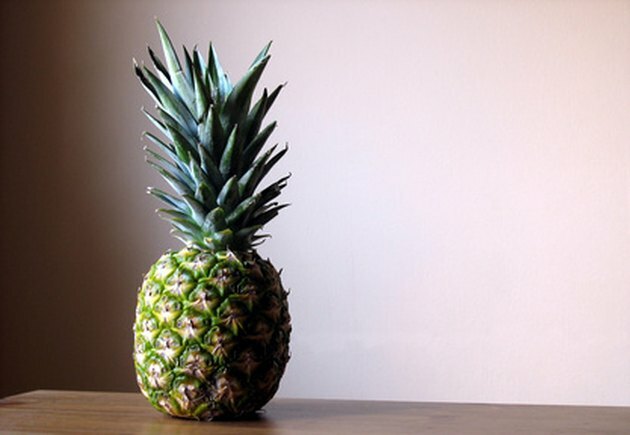 Make an exotic table centerpiece using a fresh pineapple. Use a sharp knife to carve oval shapes out of three sides of a pineapple. Cut large ovals, leaving an inch of uncarved pineapple above and below the shapes. Use a large spoon to scoop out the inside of the pineapple through one of the oval cut outs. Set the inside of the pineapple aside to enjoy later. Dry out the inside of the pineapple prior to inserting the candle. Stuff the pineapple cavity with several paper towels and allow it to dry out for two hours. Remove the paper towels. Insert a tea light into the hollowed-out pineapple. Choose an unscented candle in a metal or plastic base. Pick a white tea light for an elegant look, or a bright orange or lime green version to complement the tropical centerpiece style. Have several tea lights on hand so you can replace them throughout the dinner or event; tea lights are small and can burn out quickly. Surround the pineapple centerpiece with coordinating decor items. Fill two white vases with island-inspired blooms, such as orchids or Birds-of-Paradise, and set them on either side of the pineapple. Accent the pineapple decor with potted tropical plants, such as small palms, ginger and hibiscus. Scatter small seashells, sand dollars and starfish around the centerpiece.